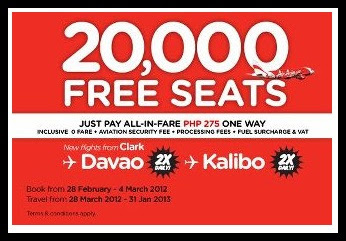 > 20,000 FREE Seats up for grabs from Air Asia! 20,000 FREE Seats up for grabs from Air Asia! 20,000 FREE Seats up for grabs! With Philippines’ AirAsia, you can now fly to DAVAO and KALIBO for PHP275 all-in-fare for one way! Tell your friends and family to grab this amazing Low Fare from AirAsia up to March 4, 2012 at 00:01hrs @www.airasia.com !!! Talaga? Ma try nga! Tnx dito ha!